With Cathy Foley, just a few moments after her first open cockpit biplane ride. Landing a vintage open cockpit biplane on grass is one of life's most pleasurable experiences. Certainly flying, itself, is near the pinnacle of human achievements, and the flying of an open cockpit biplane, especially the beautiful Waco YMF (my plane! 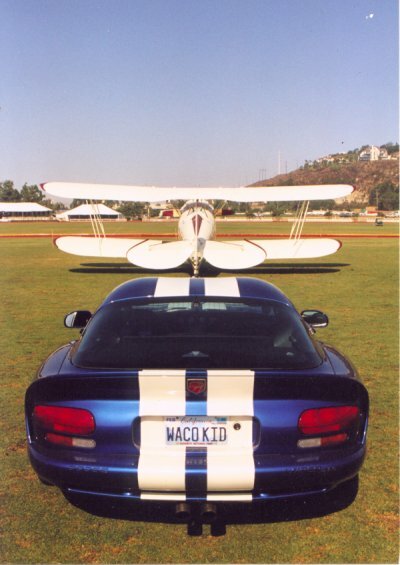 )… this is flying at its best. And, of all the various phases of flying, it is commonly held among aviators that the very few moments leading up to and following the instant of landing are the quintessential droplets of perfection in an ocean of extraordinary emotions. The icing on this delicious cake is landing on grass, as God's infinite wisdom intended. Grass is the perfect medium to welcome an aircraft back to earth: organic, soft and forgiving. Today we landed on no ordinary patch of grass, our destination was the manicured turf of the Del Mar Polo Club, a surface so perfectly flat, smooth, green and lush, it's the stuff of an aviator's dreams. Such a magnificent runway could make landings easy, almost boring. But this field sits in a valley, the approach end blocked by a hill dotted with homes. The arriving pilot must skim these rooftops, fly between two sets of 25 foot tall light poles, then clear a fence, all at the slowest possible airspeed, and therefore at the speed of least controllability. Any error could be very unpleasant. It is essential to touch down as soon and as slow as possible because this field terminates mercilessly with a row of tents, a roadway lined with utility poles, wires, trees, buildings, and a barrier of very tall power lines in the near distance, the final indignity for the indecisive pilot who delays a go-around after landing too long. This great scene is further enhanced because of its rarity. There are zero public grass fields in Southern California, and this field is open only 24 hours per year, during the season finale polo match. Selected vintage aircraft are invited to land late on Saturday afternoon, stay overnight to be on display during the event on Sunday, then fly out immediately after the contest. I attempted this 3 years before, when I was still a novice pilot. Although I could make reasonably good landings, I didn't have the confidence for this tricky approach, so my instructor, Lowell Williams, a P-51 Mustang fighter pilot during WWII and a living legend in aviation, rode with me for "insurance". While I cleared the obstacles on final, I was too fast and floated far down the runway, the tents and the power lines getting bigger and bigger until I could no longer endure it and begged "Help!" to Lowell over the intercom. 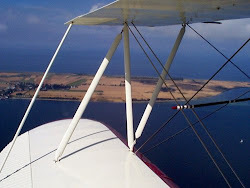 Immediately, I could feel the stick respond to the master's hand, and my big old biplane touched down perfectly, braking to a stop with little room to spare. It was a huge learning experience for me, although he never uttered a word. 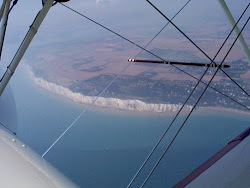 A new friend, Cathy, has been asking to go flying, and it seems as if this would be a most exquisite opportunity to share with her, especially since she has never flown in an open cockpit biplane. Lifting off out of Palomar airport, we climb to 1000 feet for a brief cruise to the coastline, then let down to just 100 feet above the surf. We rumble south along the beach, Cathy taking pictures and enjoying the view. The haze was too thick to continue to La Jolla, so we execute a steep climbing turn over Torrey Pines and head inland, flying over the polo field to see if other planes had arrived. At 1500 feet, we can make out a line of six tiny winged insects on a miniature green postage stamp. I radio the field, they say the way is clear, and come on down! Approaching from the north, I fly an overhead break at 1000 feet at mid field, turn smartly downwind, cutting the throttle and losing altitude at a rate which will hopefully get me to touchdown without any further throttle inputs. 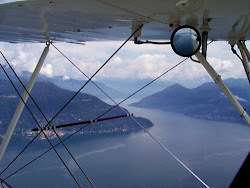 I can be high and burn off altitude, but for a perfect dead stick landing, I absolutely can not be too low, or the houses, the light posts, or the fence will surely bite me. This is the tricky part, how far out to go before turning downwind, then how long before turning base, and when to turn final so that all the while I'm losing just the perfect amount of altitude? There's no real thinking at a time like this, only reacting. My mind does not say "nose down, pull up, strong head wind…" or the like. It just "happens". The turn to final is perfect. A bit too high, but that is my acquired trademark. I like to burn off extra altitude with a slip, turning slightly sideways in the air, using the fuselage as an air brake. The rooftops whisper past the wheel pants. I'm in just the right position to pass between the light posts, still sideways. The light posts slide by as if in a dream, the fence is cleared by several feet, I straighten out the biplane at the last possible second and ease back the stick for a 3-point landing, the tires tickle the short blades of grass, touch down lightly and roll out with room to spare. "Cheated death again!" I shout over the intercom. "Really nice landing!" yells Cathy. The most beautiful music any pilot can hear is a passenger's honest thanks for a joyful experience. The hugs are nice too. Landing an open cockpit biplane on grass is great, but sharing it is best!